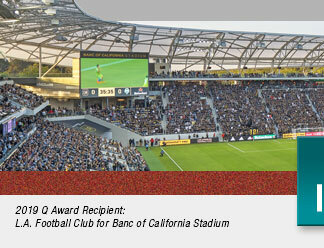 Los Angeles, CA—March, 15, 2019 - The Alliance for Quality Construction is pleased to announce the Banc of California Stadium as the 2019 Q Award recipient, chosen for the project’s 100% union construction, excellent safety record, innovative design, and its ability to provide construction jobs locally. 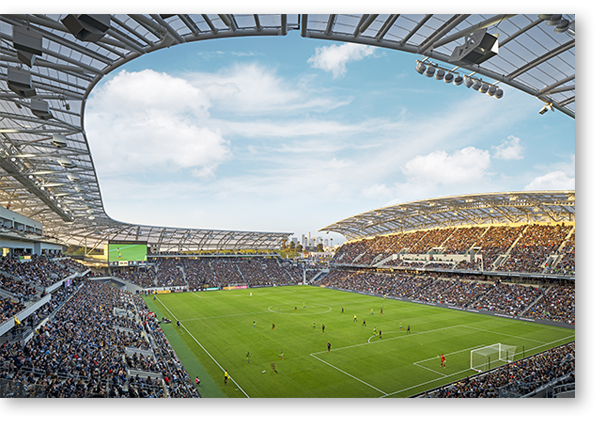 The Los Angeles Football Club Banc of California Stadium is a 22,000-seat, world-class soccer stadium located at the epicenter of Los Angeles in Exposition Park. This cutting-edge venue is the first open-air stadium built in Los Angeles in over 30 years and features the steepest seating bowl in Major League Soccer (34 degrees). Other key features include 35 luxury suites, three private clubs, and the Sunset Deck on the top level highlighting a water feature. “The North End” Supporters Section features the only safe standing section on the West Coast and the first safe standing rail seats in North America. The rail seating system allows for comfort and safety while eliminating obstructions, allowing fans to safely stand shoulder to shoulder, with the option to sit. The project’s General Contractor, PCL Construction, previously won multiple Q-Awards for well-known projects including NBCUniversal’s Harry Potter attraction, the Staples Center, and the Home Depot Center (now known as Dignity Health Sports Park). Gensler Architects, Thornton Tomasetti Structural Engineers, ME Engineers, KPFF Civil Engineers, and MLA Landscape Design also added key contributions to the stadium’s structural success and aesthetic appeal. Throughout the construction of this project, workforce grew to nearly 500 workers daily, with over 3,000 individual trade workers employed. 70% of the workforce hours are attributed to LA County residents. “With our partners at LAFC, we negotiated a Project Labor Agreement that guaranteed good union construction as well as hiring targeted toward our local community members and our veterans,” said Ron Miller, Executive Secretary of the Los Angeles/Orange Counties Building and Construction Trades Council. The multifaceted development serves as a central hub for sports, entertainment, civic, and cultural events and includes a center that is open on non-game days. The plaza, open year long, features restaurants, shopping and a conference and events center, and has boosted the local economy by employing approximately 1,800 permanent full-time employees. Additionally, the Banc of California Stadium has boosted the South Los Angeles economy by bolstering $130 million in annual economic output and is projected to bring in an additional $2.9 billion in the next 30 years. “This state-of-the-art stadium is a huge part of the economic growth of South Los Angeles. We’re proud that it has brought the men and women of this community into union building careers,” said Ron Miller. The Q Award event will be held on Tuesday, May 21 at the Banc of California Stadium, 3939 S. Figueroa St, Los Angeles, CA. Please contact Amy Cisneros at (949) 777-3855 for more information about this event.